Finding a good job with a felony conviction can be a real struggle. However, there are a number of different high paying jobs for felons out there. Particularly, the IT industry is open to hiring qualified ex-cons, and many high-tech companies are willing to overlook a good candidate’s criminal background. While it is true that high salary, white collar jobs are very hard to land if you are a felon, it is relatively easier in IT. Because of a new initiative, called “Fair Chance Business Pledge” that was launched by the White House in April 2016, a number of very large tech companies, have pledged NOT to discriminate against applicants who have a felony. 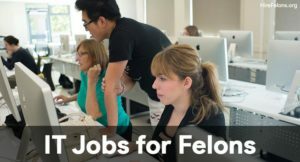 This guide is for felons who want to learn how they can get their foot in the door with an IT company, and start earning much better pay than most other felon-friendly jobs. 1. Network support administrator: in the modern wired world, network support specialists are like secretaries. They run the computer systems networks for businesses large and small. They also set up new networks, install computer software, and troubleshoot various types of networks if they are down. 2. Database administrator (DBA): more and more companies rely of the cutting edge skills of DBAs to help with their daily operations. Using special software programs (these vary depending on the industry), database administrators organize and store critical data for the company and make it available to users and employees. Often DBA’s are tasked with creating an entirely new database for a company’s growing needs. 4. App developer: mobile app development is one of the fastest growing fields with a lot of high paying jobs. Many companies hire app developers to develop programs for their customers both on iPhone and Android. There are also developers that create gaming and other entertainment apps. 5. Web developer: this is one of the best jobs in the technology and information sector. The main responsibility of a web developer is to create and design websites. You work out the visual design along with the back-end: usability, functions, navigation, layout, etc. Here is a list of the largest corporations in the US that have a history of hiring felons for computer, IT, tech support and related jobs. Many smaller companies that are not in the business of information technology per se, still have IT departments that provide computer and network support to the employees. These companies may hire a number of tech support personnel to help with daily system operations and management. What this means in practical terms is that these companies will evaluate your application and will give you a fair shot at the job based on your qualifications, education and experience. You will not be automatically rejected because you have a felony! So if you already have training in IT, or are planning to pursue a college degree in this fields of computer science, network administration, or technology development, you should know that you will have work opportunities available. It important to keep in mind, that computer science and information technology are one of the most competitive fields to get into, so you have to have very strong skills to be selected. Growing job sector: IT continues to experience more growth than other fields, which means that new jobs are constantly being created. This year, a large online job search engine, Monster, identified application/software developers as one of the 10 fastest-growing job titles for 2019. Employers care MOST about your ability to get the job done: This means that if you work hard and have solid skills, you can be successful. You personal history will not be of primary importance to many employers. No need for a prestigious college diploma or certificate. Again because employers place the emphasis on skills and results, many are not looking for you to have a B.A. in computer science of engineering from a top university. This means you can take online courses, get an online associates or BA degree, etc. If you are willing to work hard and teach yourself, you can be as good as someone who has an expensive 4-year degree. In addition to demonstrating that you are qualified for the job you need to be prepared and proactive about discussing your felony. Here is what you can do to create the best impression and convince the HR manager why they should hire you. 1. Be honest: It is best to honestly state that you have a felony during the initial interview. Briefly explain what happened and make it a point to describe in detail how you have changed and became a better person after this experience. This may be the factor that determines whether or not you will be hired. The worst thing you can do is not to disclose your felony and just let the HR find out about it through the Background Check. In this case, the chances of you getting that job will ZERO. 2. Get rid of visible tattoos: Having gang-related and anti-social tattoos is one of the top factors that prevents many felons from getting a white collar a job. Remember, the HR manager is looking to see if you have made the transition from the prison-world back to society, and visible tattoos will not work in your favor. There are numerous tattoo removal programs in different states that will help you remove your tattoos free of charge. Hopefully, all of these factors can play in your favor, especially if you have been very honest and forthcoming about your past. In addition to trying to get a job with one of the big companies listed above, don’t lose sight of other viable opportunities in IT. Start-ups: some of the best paying jobs for felons can be at a start-up company. While a start-up may not pay as well as an established company, you will still earn more money than in most other types of jobs. Moreover, a start up may be more willing to overlook your personal history, if you have the skills they are looking for. Also, people that work in these companies are often more approachable and understanding of different circumstances, as compared to HR managers in larger firms, where there are many rules, policies and protocols that need to be followed. Internships: while this is not ideal, especially if you are pressed for money, starting your IT career with an internship may be a good way to get your foot in the door. This will give you something great to put on your resume and will be another reason to overlook your felony. Consulting/Freelancing: one of the best ways to find success in IT and avoid getting turned down from jobs because of your felony is to start your own freelancing business. There are many niches to choose from, such as: web development, app development, design, computer repair, database administrator, etc. All you need is your skills and one or two satisfied clients who will serve as great references for future jobs. Successful consultants can make $120K or more. If you are still serving your sentence but are looking into career opportunities to pursue once you get out, you can start learning an IT skill while still in prison. If you are incarcerated in California, ask about a program called Code.7370. This is a government sponsored program which trains prisoners in HTML, Ruby on Rails, CSS, Python and other technologies. Code 7370 is an initiative that has been started by a none profit organization, called The Last Mile. The organization has partnered with California Department of Corrections and Rehabilitation to provide prisoners IT training that can help them get a good paying jobs once they are out. If you are not in California, you should inquire about IT skills training opportunities that may be available to you. If there are none, you can take online self-training Tech Job Courses on Udemy.com. Many beginners courses are FREE. These classes are a great way to try out programming or design, to see if this is something you like and are good at.